Although care is taken to properly design electrical and electronic circuits; overcurrents in the form of short-circuits and overload can occur. The sole purpose of fuses and circuit breakers is to protect personnel and/or equipment from serious harm when an overcurrent condition arises. This guide is intended to help create a better understanding the various parameters of overcurrent protection and the proper application of circuit protective devices. 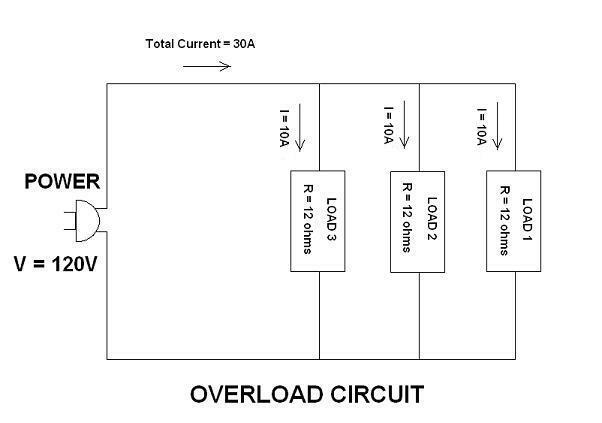 This guide creates a basic understanding of overcurrent principles and applications but is not intended to supplant sound engineering principles or replace specific application testing. 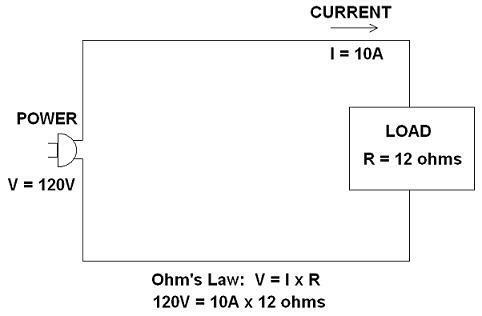 What is the normal operating current of the circuit? Is the circuit AC or DC? What is the operating ambient temperature? 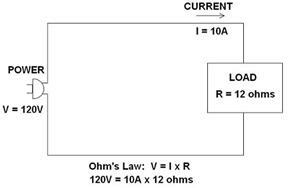 What is the available short-circuit current? What is the maximum allowable I²t? Are there in-rush currents available? Is the protective device being used for short-circuit protection, over-load protection, or both? What are the physical size limitations? Is the PCB surface mount or thru-hole? Does the fuse need to be "field-replaceable"? What safety agency approvals are needed? How will I mount the device? In order to select the right amperage of the fuse, you first need to know the full-load steady-state current of the circuit at an ambient temperature of 25º C (68º F). Once the current value is determined, then a fuse rating should be selected as to be 135% of this value (taken to the next standard value). It is important to note that if the fuse is intended to be used in an environment with possibly very high or low ambient temperatures, then the nominal fuse current would need to be sized significantly higher or lower (see ambient temperature below). The basic rule of thumb is that the voltage rating of the fuse must always higher than the voltage rating of the circuit that it is protecting. For example, if the circuit voltage is 24 volts, then the fuse voltage rating must be higher than 24 volts (yes...it can be 250 V...just so long as it"s higher than the circuit voltage). There exist two distinct types of circuits AC (alternating current) and DC (direct current). AC power is what you will typically find in your home from the electrical utility. AC power is created primarily by moving machines such as generators and delivered through the electric grid. DC power is typically used in electronic and automotive applications. DC power generally is created via a chemical reaction (as batteries and solar cells) or converted AC power through the use of AC to DC power supplies. With AC power, the current and voltage oscillate back and forth. This oscillation helps the fuse to clear quickly. DC power on the other hand doesn"t oscillate so the fuse must find other means to clear itself when opening. Ambient temperature is a fancy way of saying the “outside air” surrounding the fuse. Normally, the fuses are tested in "laboratory conditions" by the safety agencies such as UL and CSA. The lab conditions are almost always set at 25°C or 77°F. Unfortunately, most real world conditions are not those found in a laboratory. Fuses are heat sensitive devices meaning that it takes heat (via the overcurrent) in order to melt the fuse element inside the fuse. The more heat...the faster it takes to melt the fuse element...the less heat...the longer it takes to melt the fuse element. If a fuse will be subjected to a higher temperature than 25°C, then the fuse amperage will need to be increased as to compensate for the higher temperature (to avoid "nuisance tripping"). Likewise, if the fuse will be used at a lower temperature, then the fuse amperage needs to be lowered (or else it might never open). Conversely, when a fuse is intended to be used in extreme low temperature conditions, the fuse must have a lower rating than that in normal conditions. The available short circuit current is the measured or calculated current that can be delivered to a circuit by a power source when a short circuit is present. This information is extremely important as an overcurrent protective device has only a finite ability to safely open a circuit when a fault condition occurs. Therefore the amount of fault current available is a critical piece of information in order to select the proper protective device. How much short-circuit current is available from the utility? What is the resistance of the wiring from the utility to the piece of equipment where the fuse is installed? Once all of these factors are known, then the engineer can calculate the available short circuit current to the fuse. All overcurrent protective devices take a certain amount of "reaction time" when they open to clear a circuit fault. During the time it takes for the fuse to open, there is energy flowing through the fuse. That energy is measured in I²t. There two parts to the fuse"s "reaction time". During this clearing time, there is energy is being "let-thru" the fuse. The downstream components are then subjected to this extreme energy as it passes through the fuse (if only for a few milliseconds). In order to specify the proper fuse or circuit breaker in a circuit, the engineer must know the withstand capabilities of the downstream circuit components and select a fuse whose let-thru energy is below that of those components. Are there "in-rush" currents available? Depending on the circuit, there are times when a large amount of current is required when a piece of equipment is turned on. The types of components that can cause this type of in-rush include motors, fans, and capacitors. The in-rush current can be as high as 6-10 times that of the normal current (for example a typical TV might draw 3A but the in-rush could be as high as 30A). These currents are typically harmless and subside within 1-2 seconds of startup. During an in-rush, the fuse should not open. The specified fuse in this case should be a time-delay fuse allowing the piece of equipment to start up properly without a nuisance opening of the fuse when the overcurrent occurs. Many times the fuse or circuit breaker needs to be mounted into a place with physical size limitations. It is this reason that fuse and circuit breaker manufacturers have created a wide selection of components with varying physical sizes. Typically however, there are a trade-offs that the engineer must consider. Generally speaking, the smaller the fuse, the less current and/or capabilities that the fuse or circuit breaker may have. For example, a subminiature fuse maybe limited to 15A where as the larger 1/4" x 1 1/4" glass tube fuse can accommodate up to 40A. There are several different options for both surface mount fuses and thru-hole fuses. With surface mounted fuses, there are multiple sizes available from a 6125 (6.1 x 2.5 mm) package all the way down to a 0603 (0.6 x 0.3 mm) package. The thru-hole options are even greater with axial-leaded options available on all of our standard glass and ceramic fuses as well as a variety of leaded subminiature and micro fuses. These same options are available in resettable fuses as well. Additionally, the fuse mounting can also play a part in the designers" decision especially if the fuse needs to be field-replaceable. The primary reason for making the fuse replaceable is simply convenience for the end-user in getting their equipment back up and running. The manufacturer may not want the end-customer to access the interior of the equipment to replace the fuse for liability issues. This is especially true when a short-circuit was the cause of the problem in the first place. There are one-time use fuses and resettable type fuses available to the engineer. Both types of fuses provide short-circuit and over-load protection. Resettable fuses are limited to circuit applications below 9 amps (at 12V) and even less current at higher voltages. Circuit breakers can also provide resettability and can range from 1A to 6000A. One-time fuses are just as their name implies. Once they are called upon to act, the interior link melts and the fuse must be replaced. Just because the fuse is replaced, there can still be a short-circuit or over-load still present in the circuit which can cause the newly replaced fuse to open as well. Care should be taken to correct whatever problem that may have occurred when the fuse opened in the first place...before replacing the open fuse with a new fuse. There is an entire alphabet soup of world-wide safety agencies out there. UL, CSA, IEC, CCC, PSE, VDE, Nemko, Semko and TUV are some of the most popular agencies. The agency approvals needed by manufacturers depends solely on what type of equipment they are making and where in the world they hope to sell their equipment. Fuses typically are available with several approvals (for example UL and CSA). Even within a single agency, there can be multiple types of approvals such as UL listing versus UL recognized. .
Certain equipment does not require any agency approvals such as many automotive or low-voltage applications. The biggest issues as it relates to safety agency approvals for fuses is that there are several different test methodology and standards depending on the agency involved. This might mean two different fuse characteristics for what is apparently the same fuse and/or application. How will the fuse be mounted? Direct Solder - In this method, the fuse is directly soldered into or onto the printed circuit board (PCB). The drawback to this design is the lack of field replaceable parts as discussed in great detail in section 11 but cost can be significantly reduced with this mounting method. Fuse Clips - Fuse clips are relatively inexpensive and allow for field replaceability. Fuseclips are typically mounted on a PCB so any attempt at replacing the fuse will require opening of the piece of equipment by the end-user. Additionally, removing a fuse from a PCB without disconnecting the power source could lead to an electrical shock when touching the fuse. Fuse clips are available for all "tube" fuses as well as microfuses. Typically fuseclips are limited to 15A of normal current. Fuse clips are generally not listed or recognized by any safety agencies. Panel Mounted Fuseholders - Panel mounted fuseholders allow for easy access for the end-user to replace the fuse in the field. The panel mount fuseholder is shock-safe meaning that the fuse is removed safely when the cap of the fuseholder is removed preventing the possibility of electrical shocks. Fuseholders are typically tested and approved by safety agencies such as UL and CSA. Fuseholders are typically available up to 30A. Fuse Blocks - Fuse blocks are like fuse clips however they do not need to be mounted on the PCB. Fuses mounted in fuse blocks are typically only accessible by opening the piece of equipment which could lead to electrical shocks if the equipment is not disconnected from the power source. Fuse blocks are one of the few methods to mount fuses of large amperage. Inline Fuse Holders - Inline fuse holders are typically used as a part of a wire harness assembly or where no surface is available to secure another type of fuse mount. Inline fuse holders are generally available up to 100A in lower voltage applications and up to 30A in higher voltage applications. The costs considerations can vary by several degrees depending on the size, performance, and mounting of the fuse. Generally speaking, the larger a fuse is; the most it will cost (due to higher material costs to build the fuse). The performance characteristics of a particular fuse are also a large cost consideration. A low voltage automotive fuse might a fraction of the cost as compared with a 500V super high-speed, ceramic tube fuse both rated at 10A. Safety agency approvals will also add to the overall cost of the fuse. One of the largest costs of a fuse is the fuse holder. A typical panel-mount fuse holder may cost in upwards of 10 times than that of the fuse itself.